The Institute houses a collection of pottery assembled between the 1940s and the 1970s. 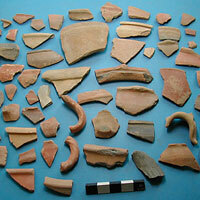 The majority is fragmentary pottery (and occasional stone items) from surface surveys, such as the Central Anatolian Survey, but there is also sample material from some important excavations carried out in Turkey under the auspices of the British Institute such as Mersin, Hacılar, Beycesultan and Catal Höyük; and some obsidian from Ashikli Höyük. There are over 1000 boxes of material organised into 3 broad categories: survey, excavation and published material; as well as a 'study' and 'slide' collection. All periods are represented, from the Neolithic to the Ottoman and although not all types of pottery from Anatolia may be represented, examples of the vast majority of types can be found.